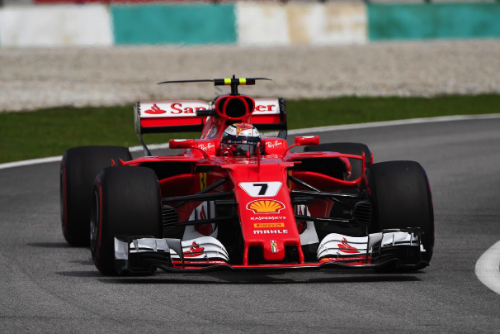 Kimi "The Iceman" Raikkonen posted the fastest lap time during Free Practice 3 on a hot afternoon in Malaysia. His Ferrari teammate Sebastian Vettel wound up second. The lineup for the weekend was: Mercedes - Lewis Hamilton and Valtteri Bottas; Red Bull TAG Heuer - Daniel Ricciardo and Max Verstappen; Ferrari - Vettel and Raikkonen; Force India Mercedes - Sergio Perez and Esteban Ocon; Williams Mercedes - Felipe Massa and Lance Stroll; McLaren Honda - Fernando Alonso and Stoffel Vandoorne; Renault - Nico Hulkenberg and Jolyon Palmer; Toro Rosso Renault - Pierre Gasly and Carlos Sainz; Haas Ferrari - Romain Grosjean and Kevin Magnussen; Sauber Ferrari - Marcus Ericsson and Pascal Wehrlein. Vettel went quickest on Friday with an unofficial lap record time of 1:31.261. Mercedes, meanwhile, was way off the pace on Friday. "It's been a very difficult day," Hamilton said on Friday after his best lap of 1:32.677. "I've been struggling with the car today, so we have to review and try to understand where we have gone wrong with the balance. We're hoping that we're able to find our bearings overnight and regroup for tomorrow." Mercedes fitted new parts to Bottas' car for Saturday to see if it would solve the problem. The ambient temperature at the start of the 60-minute session was 88 degrees Fahrenheit (31 degrees Centigrade) and the track temperature was 111 degrees Fahrenheit (44 degrees Centigrade). There was a 20 percent chance of rain. Pirelli's dry weather slick compounds were medium, soft and super soft. The Saubers were the first out. Grosjean joined them. The Haas crew had worked late to repair his car that was damaged after he hit an upturned drain cover and crashed in FP2. Also on track was Verstappen, no longer a teenager as he turned 20 on this day. As in FP2, the Ferrari drivers were soon on top of FP3. But then Hamilton, on the super softs, went ahead with a 1:32.650, beating Raikkonen by 0.015 of a second. Hamilton then improved to a 1:32.539. With the initial runs over, the order was Hamilton, Raikkonen, Vettel, Verstappen, Bottas, Ricciardo, Perez and Ocon. Things got a bit quiet just before the midpoint of the session, so Alonso livened it up by spinning at Turn 15. Then Ricciardo used a new set of super softs to take the top spot with a 1:32.091. Bottas got up to second with a 1:32.329. A few minutes later Vettel tried his second set of new super softs, and he grabbed the lead with a 1:32.042 only for Raikkonen to cross the line moments later with a 1:31.880. The order with less than 15 minutes to go was now Raikkonen, Vettel, Ricciardo, Bottas, Hamilton, Verstappen, Ocon, Perez, Stroll and Alonso. Pirelli tweeted: Super softs are around 0.8s quicker than the soft tire, so should be the default choice for qualifying: unless anyone is feeling brave? Meanwhile, The Iceman remained out front ahead of Vettel, Ricciardo, Bottas, Hamilton and Verstappen (who had a last-minute spin when he got a puncture after clipping Palmer in Turn 15). "What an idiot!" Palmer said. "He hit me," Verstappen said. Changes in the next group in of the top 10 saw Perez ahead of Massa, Ocon and Vandoorne.